• Start with two different colored flat shoelaces, each the correct length for that shoe. • Hold both flat shoelaces together to resemble a double-thickness, double-sided shoelace. • Using that double-sided shoelace, lace the shoe normally as per Criss Cross Lacing. 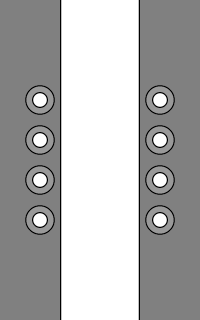 At each set of eyelets, folding the laces carefully will alternate the color that sits uppermost. 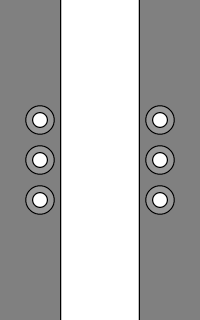 • At the top of the shoe, once again hold the two ends at each side together as though they are one double-thickness shoelace and tie a regular Shoelace Knot. 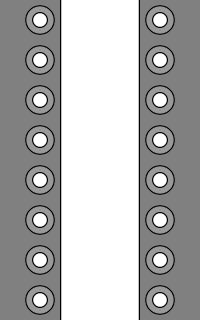 • When using two laces, ensure that they are fairly thin because each eyelet has to accommodate two layers of shoelace. • To make tying easier, leave the ends of one color shoelace tucked into the top of the shoe and only tie with the remaining ends of the other color. Nike Mavrk 6.0s with Double Sided Lacing. 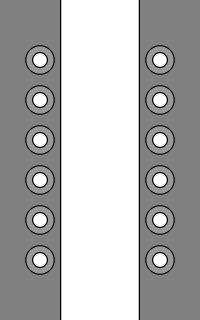 The technique shown above is effectively a double sided variation of Criss Cross Lacing. 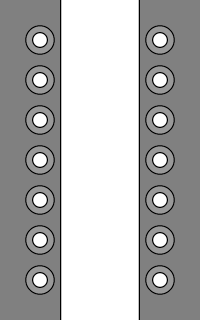 However, the same double sided concept can be applied to any lacing method to turn it into a bi-color variation with alternating colors. See below for some photos of variations. These double-sided shoelaces from Mr Lacy are called "Clubbies" because they feature the team colors of popular soccer clubs. Creates the same bi-colored effect without the hassle of tightening and tying doubled-up shoelaces. Similar looking bi-color method with the laces running at a steeper angle and the colors overlapping. 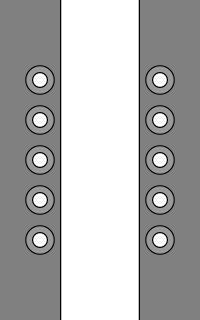 Single-colored lacing method on which this bi-colored method is based. This page last updated: 15-Oct-2018. Copyright © 2009-2018 by Ian W. Fieggen. All rights reserved.